I have a brand-new-to-me Model 41 that I shot for the first time last night. I experienced some failures-to-feed with resulting failures to attain battery troubles. I first suspected that the "ears" on one or both of the magazines that came with the gun might be bent ...loading the mags seems to be a little more of an exacting affair than I'm used to = cartridges seem to have to be at just the right angle to be successfully inserted. But, breaking down the pistol I immediately felt very sharp "hooks" on the feed ramp. I'm inserting a fairly good photo of the "burrs"
on both sides of the bottom edge of the ramp. The "points" formed at either side of the semi-circle of the bottom edge of the ramp have been "folded" back (upset) on themselves. It's like the barrel was dropped on a hard surface with the impact being absorbed by the ramp. Or maybe the previous owner tried to force the barrel back onto the frame without having the lug lined up with the opening in the frame. My plan would be to VERY CAREFULLY grind away the upset metal that's bulging above the ramp's smooth, semi-circular face. I'm more confident about my ability to remove the burrs with my Dremel than with a file. Once I get the excess metal removed and, hopefully, down to just about the level of the ramp's face I may switch over to a very fine file ...but most likely I'll wrap the file with some abrasive paper. Hopefully, at that point I'll mostly be looking to polish the area. By the look of it, the face of the entire ramp could do with a little polishing. The barrel is a stock 5 1/2". My 22 LR ammo of choice is CCI Standard Velocity Target, Lead Round Nose (LRN -- 40 grain bullet -- muzz vel = 1070 fps, with which I've had very nice functioning with a variety or semi-autos. My Club's indoor range is limited to lead bullets no matter the caliber. Does anyone have any thoughts, suggestions or dire warnings? I am happy to report that, despite the feeding issue the gun is fantastic. I was getting better groups using the 41's iron sights than I produce using the red dot on my Ruger Mark III. The trigger is heaven! I've only been shooting pistol for a year now, and as I mentioned, I've only owned the S&W 41 for 48 hours so I'll appreciate any and all advice, no matter how basic. not a big issue, take a piece of emory cloth and smooth out the rough spots, then in you want use a dremel and some rubbing compound to polish it to a smooth surface. i have the same, worse even. deep gouges in right shoulder of feedramp, and there's a lip of metal between the feedramp and that shoulder, sort of like the molten metal oozed out when being formed. mine wouldn't feed anything. i sent it back to s&w... haven't heard a peep. Out of curiosity; how old is your M41 (production year)? spursnguns wrote: ........Out of curiosity; how old is your M41 (production year)? My M41's serial number A584### would have it being manufactured late 1979 or 1980. I just have to compliment you on your ability to take close up photos. Those are some impressive pictures. Hope you get your 41 running like a sewing machine. That ramp/chamber area is a little rougher than I would expect to see from that era. Nonetheless; if you are going to DIY, Brownells sells round hones/stones that are dimensioned (nominally 3" by 0.25" diameter) to fit perfectly in .22 feed ramps. They will make quick work of the job and will not hollow out the ramp or change any angles. Don't forget; you'll want to make a smooth feed ramp and not a mirror (don't overdo it). Thanks Mike! I have to admit that before I was a woodturner/shepherd I was an import/export insurance broker. And, prior to insuring goods in transit on the high seas and in the blue yonder I was a professional photographer. These days almost all of my picture-taking is related to putting photos up on websites or Facebook pages. Hey Jim! Thanks for the info about the stones at Brownells. I have a few round (thought tapered) stones that I use for sharpening gouges (I'm a woodturner by trade these days). But, a non-tapered 1/4" stone would make a lot of sense. God bless Brownells! Unfortunately, I'm no longer able to blame my 41's poor performance on the feed ramp. The slide does not seem to return to full battery evrery time. 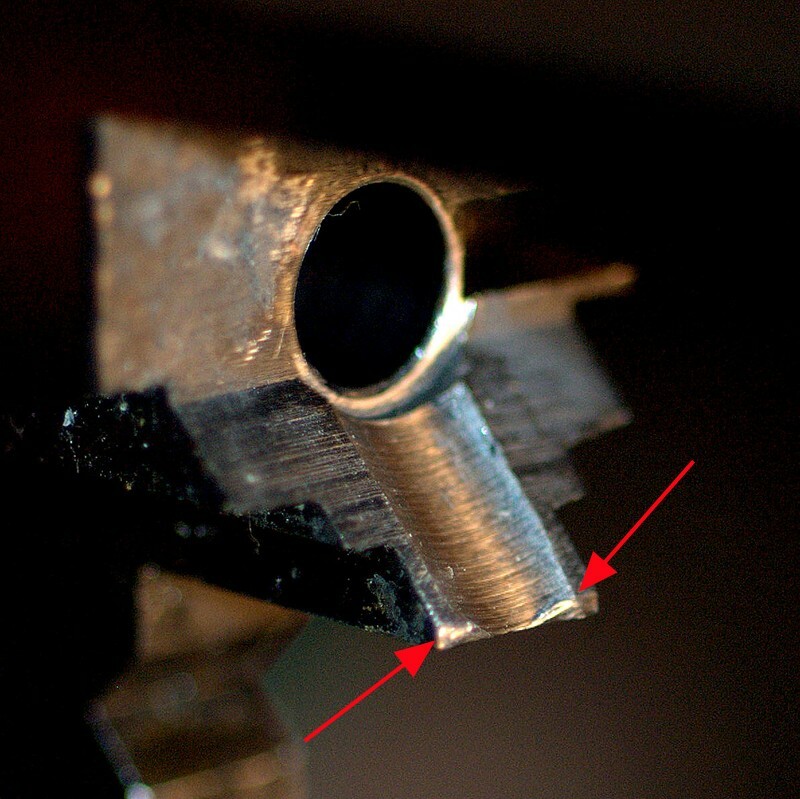 Pulling the trigger, I get a click and a very light firing pin indent on the cartridge's rim. Sometimes, after firing, and before pulling the trigger again, if I reach up with my thumb and push on the back end of the slide I can feel it "click" into place (1/128th" ?? ..the slide "moves forward" an imperceptible distance ...I can feel and hear it, but not see, it move forward into battery. The gun always fires after that. I took the firing pin and extractor and scrubbed out any old oil/grease from the action; soaked and brass-brushed the chamber. I switched out the stock (I assume) recoil spring the gun came with (at least to me) for a 6# spring that a friend brought to the range, but the mis-fires continued. I also tried his magazine which he assures me works okay in his 41, to no avail. I've collected three other type of ammo to try. But, my next chore is to really study the innards with a loupe and magnifying glass to see iff there might be another burr or clump of gunk that slowing or restricting the slide's forward movement. Could the trigger adjustment have anything to do with any of this? I haven't touched that little screw on the trigger guard. I love a good mystery! ..just wish I were a better gunsmith. I see that you are using CCI Standard Velocity ammunition. If you are refering to CCI's No. 35 load....try their No. 32, 33 or 51 loads. Depending on you grip strength; a 6 pounds recoil spring is a little light. Try a 6.5 pounds, first. Also; it is not unheard of to have to hone the rails of a M41 to get proper functioning. Mount you slide on the frame, without the barrel or springs, and check for any binding along its full travel. Have someone with the skill to knock off any high spots....no lapping material, please. There are lots of other possibilities; slide misalignment and the extractor is hitting, extractor scarfed up and is hitting, etcetera; trigger adjustment won't be one of them.